A little bit slouchy, a little bit chic! 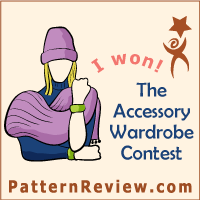 That's how I would sum up the new Amber trousers pattern from Paprika patterns. These super-comfortable pants fall softly from a fitted and flattering yoke. Inverted front pleats give a nice draped effect and lots of room to move. They can be made with a wide or tapered leg. I chose the tapered style, View A.
I was given this pattern for no charge in exchange for an honest review. I made size 4 based on my hip size and tapered the yoke to a size 5 at the top to fit my waist measurement. This was perfect for me and the pants required no further adjustments. The only thing I would say is that the legs were a bit short on me - more like 7/8 length instead of full length. I am about 5'9. I didn't mind the shorter length and have rolled them up a couple of times in these photos to make them even shorter for warm weather. The fabric I used was a printed polyester that I have had in my stash for some time. It is very drapey, so perfect for these pants. I would love to make them again in silk. The pants are fastened on one side with an invisible zip. This would be the trickiest part of making the pants. I followed the instructions, but used Washaway Wonder Tape to hold the zip in place before stitching, rather than pins or glue. I was put on to this brilliant product by Savage Coco Patterns (she knows her notions, that girl) and it is the best thing ever for invisible zip success. The yoke is interfaced to hold its shape. I used lightweight interfacing here, which was just enough to be supportive but not too stiff. The yoke is comfortable and flattering. The pants have side pockets, which are deep and just right. I have made most of the Paprika Patterns range, often several times over. All the patterns are well thought out and have really clear instructions. The online tutorials are also great to supplement the written instructions if anything needs further explanation. This pattern is no exception. 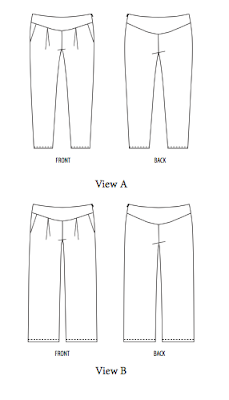 I didn't use the online tutorials as the pattern instructions and diagrams were very detailed. 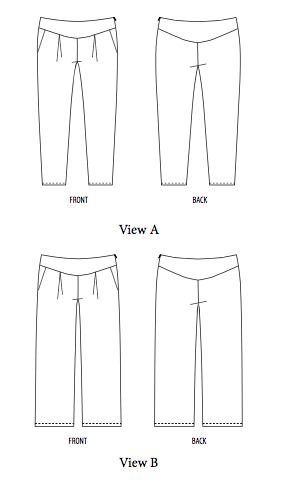 The Amber trousers are not difficult to sew and could be tackled by a confident beginner. I like this pattern. It's easy to sew and easy to wear. You can get it at a discount for the next few days of May 2016 here. I'm wearing the pants with a Scout Tee made with remnants. Ooh, these are very fashionable! And they look silk! Who do I credit for that: the pattern or your usual great workmanship?! Such a shape is all around in RTW and I'm very tempted. What I really like about the pattern is that the yoke ensures the waist stays sleek and the comfort is delivered in those stylish pleats. Thank you, but you should probably credit the pattern! I didn't realise these were in, being a season behind you in the northern hemisphere. That's a bonus! These look great Megan. I must try that wash away wonder tape. Thanks for the tip. Thank you. You won't regret it! These look sensational. Wouldn't suit me though - sigh! The wide leg ones might suit you. Glad you like them! Love them to bits. Great fabric too.